In the 70 years that the Vuelta a Espana has been running, it has survived a civil war, four decades of dictatorship, periods of economic and diplomatic isolation, desperate years when the country was close to famine, disruption through political violence, and finally the restoration of democracy and Spain's welcome into the European Community. The race has changed hands several times and been shifted from spring to late summer. It has seen the triumph of foreign stars like Anquetil, Merckx and Hinault; it has given a range of top - but less godlike - cyclists such as Lucho Herrera and Sean Kelly the opportunity to taste the glory of winning a great stage race; there have also been the unknowns who came along and, out of the blue, surprised everybody by winning. And above all the history of the Vuelta recounts the story of the Spanish cyclists, whose lives reflect the incredible changes their country has undergone in those seventy years. 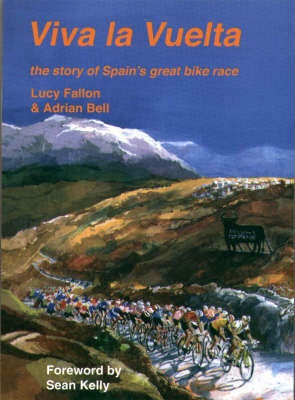 The story of the Vuelta is also an account of a race trying to establish itself in an international calendar where the Tour de France and Giro d'Italia had the advantage of a clear head-start. At times the Vuelta has suffered from an inferiority complex, but its current organisers, Unipublic, have approached their race with an innovative spirit, always on the look out for new routes and mountains to climb, and seeking to create dynamic, fiercely contested stages. For many followers of cycle-racing, the most interesting, and excitingly competitive racing of the three major tours in recent years has been in Spain. While there have been numerous books about the Tour de France, this is the only book, in any language, about the 70 years of la Vuelta.